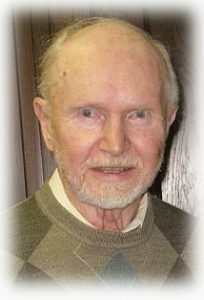 Armin John Panning, 87, died Sunday, April 7, 2019 at Rainbow Hospice Care Inpatient Center in Johnson Creek, Wisconsin, following a brief illness. Born to William and Frieda (née Bode) Panning on May 13, 1931 in New Ulm, Minnesota, he attended Dr. Martin Luther High School in New Ulm and Northwestern College in Watertown, Wisconsin. Following his 1957 graduation from Wisconsin Lutheran Seminary, Thiensville, Wisconsin, he served as a tutor at Northwestern. In 1959, he was assigned to serve as pastor of Salem Ev. Lutheran Church in Escanaba, Michigan, where he met and married Virginia Lee Nelson in 1961. In 1962 he returned to teach at his alma mater in Watertown. He accepted a call to teach at Wisconsin Lutheran Seminary in 1975, additionally serving as President from 1985 to 1996, before retiring from full-time teaching in 2001 and moving with Virginia to Port Washington, Wisconsin. From its 1993 founding until 2005, Prof. Panning was elected to various offices of the Confessional Evangelical Lutheran Conference, for which he traveled extensively. He was Friendly Counselor to the Bulgarian Lutheran Church, living in Sofia with Virginia in 2005 and 2006. Prof. Panning is survived by his sons John (Judy) Panning of Lake City, Iowa; James (Jennie) Panning of Litchfield, Minnesota; Mark Panning of Lilongwe, Malawi, Africa; and Joel Panning of Milwaukee, Wisconsin and grandchildren Alyssa, David, Kathryn and Joseph. He is further survived by his brother Frederick (Doris) Panning of Cambridge, Minnesota; sisters Clarice (Don) Fastenau of St. James, Minnesota and Norma (William) Roubik of Onalaska, Wisconsin and a sister-in-law Dorothy (Roland) Panning of Gibbon, Minnesota; many cousins, nieces and nephews. Virginia preceded him in death on March 30, 2015. The Rev. Martin Wildauer and the Rev. Don Scheuerlein will conduct the funeral service at Christ Alone (Calvary) Ev. Lutheran Church, 247 S. Main St., Thiensville, Wisconsin, on Saturday, April 13 at 11:00 a.m. Visitation precedes the service from 9:00 – 11:00 a.m. A brief service of Christian burial will be held at 4:00 p.m. that afternoon at the Lutheran Cemetery, 557 Juneau Street, Watertown, Wisconsin. Memorial donations may be made to Wisconsin Lutheran Seminary’s Prof. & Mrs. Armin Panning Student Scholarship Endowment Fund.